The off-site prefabrication construction method offers several advantages that have positioned it as a good alternative to the conventional method. Recently in South Korea, a form-latticed prefabricated steel reinforced concrete (Form-LPSRC) column was invented as substitute for a conventional steel reinforced concrete (SRC) column. This study evaluates the productivity, cost, and CO2 emission of Form-LPSRC column with those of SRC column through a case study. Two factory projects utilizing same-size Form-LPSRC and SRC columns are studied. 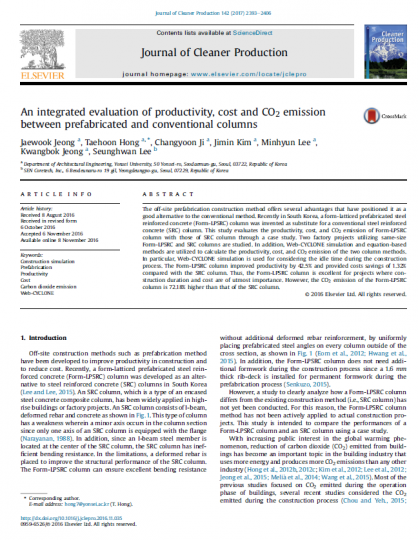 In addition, Web-CYCLONE simulation and equation-based methods are utilized to calculate the productivity, cost, and CO2 emission of the two column methods. In particular, Web-CYCLONE simulation is used for considering the idle time during the construction process. The Form-LPSRC column improved productivity by 42.5% and provided costs savings of 1.32% compared with the SRC column. Thus, the Form-LPSRC column is excellent for projects where construction duration and cost are of utmost importance. However, the CO2 emission of the Form-LPSRC column is 72.18% higher than that of the SRC column.